People travel far and wide to visit the Cloister at Sea Island. One fashion designer from New York wrote about her attachment to the peaceful resort in a recent article in the Huffington Post. She talks about the â€œseclusion of the outside worldâ€ and the â€œsolaceâ€ she finds there. Sadly for her, she has to travel each year to find that kind of peace. For the residents of and real estate Sea Island owners, serenity and beauty lie just next door. 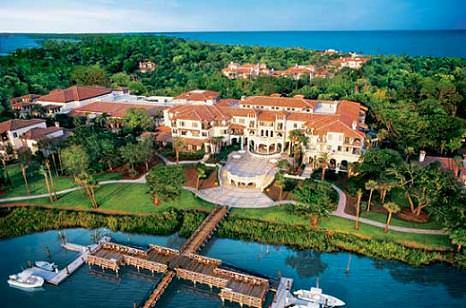 The Cloister was founded in 1928 and has remained one of Sea Islandâ€™s most luxurious resorts. The buildings and grounds were inspired by the work of Addison Mizner, a famous architect, and remain today incredible tributes to his legacy. The rooms are furnished with antique pieces whose origins range from flea markets in Paris to high end dealers in Europe and Africa. While these pieces may sound like they would be out of place in Georgia, in reality, they speak to the unique atmosphere and rich history that exist on Sea Island. The resort complex features a private beach, luscious gardens, and ample fine dining opportunities – including Georgiaâ€™s only five-star restaurant as rated by Forbes, the Georgian Room. In addition, the Sea Island Yacht Club, the Cloister Spa, and the Cloister Beach Club are all located on the property, ensuring that visitors have ample opportunities to enjoy Sea Islandâ€™s coast and waters while remaining relaxed and pampered. Fortunately for Sea Island real estateÂ owners, these amenities are not relegated to guests only. Residents can enjoy an exquisite meal at the restaurants as well as go fishing and yachting from the Sea Island Yacht Club. The Cloister Spa is also open to residents, who will be able to take advantage of the many treatments and services offered at the Forbes five-star facility. Unlike the unlucky guests who have to go home after a stay, residents of Sea Island can find peace and serenity at the Cloister whenever they want. For more information about Sea Island real estate, please contact DeLoach Sotheby’s International Realty.